Don’t forget to honor those who fought and served our Country! Memorial Day weekend is often thought of as the unofficial start to the summer season. Statistic’s from the American Automobile Association (AAA) show that approximately 34 million Americans travel distances 50 miles or more from home to enjoy their holiday weekend. Over the span of these three days, thousands of parades are held, as well as countless backyard barbecues. It is also the weekend the Indianapolis 500, the Coca-Cola 600 stock car race, and the Memorial Tournament golf event are held. With so much going on, it can be easy to lose sight of what Memorial Day is really all about. Observed on the last Monday of May each year, what we now know as Memorial Day is a United States Federal Holiday meant for remembering those who have died while serving their country in the armed forces. This tradition, which originally was referred to as Decoration Day, started just after the Civil War to honor the many Union and Confederate soldiers lost during its bloody battles. On this day, the U.S. flag is hung at half-staff until noon, in remembrance of those who gave their lives. At noon, the flag is returned to full-staff, symbolizing those we have lost being raised by the living who remember their sacrifice and continue to fight for justice and liberty. While many of us have been fortunate to live in a peaceful time, that is not true for our senior loved ones. The U.S. Census Bureau reports that approximately one in four seniors is a veteran of the armed services. They lived through a time plagued by war, and as such they are likely to know individuals who died in combat. For them, Memorial Day can be a time that fills them with many mixed emotions, and it is important to be sensitive to their needs. Below are some ways to support your senior loved one as they process through their emotions during this time of remembrance. One simple way to show your support for your loved one is to help them display the American flag outside of their home. 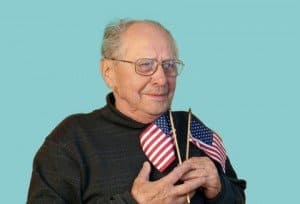 The Veterans of Foreign Wars website contains a flag etiquette page at https://www.vfw.org/Community/Flag-Education/ that will inform you how to display the flag properly. If there is a Memorial Day parade taking place near you, ask your loved one if they would like to attend. Visit the area ahead of time so that you can find a comfortable, shaded location for you and your loved one to sit. Here, it is especially important to honor the tradition of standing and placing your hand over your heart anytime an American flag passes by. Ask your loved one if they would like to visit any gravesites of departed friends or family members during this time. Check local listings to see if an American Legion or Veterans of Foreign Wars hall near you has scheduled activities honoring the holiday that your loved one may want to attend. Finally, the most important thing is supporting your loved one in honoring the holiday in a way that is meaningful to them. Take time to really listen to their needs and respect their requests.